This little vignette painting was commissioned as one of a series of five showing the five species of hummingbirds that regularly nest in Canada. The Black-chinned Hummingbird only reaches the northern limit of its breeding range in Canada, in extreme southern British Columbia, but they become common, in a wide variety of habitats, as you move south in the U.S. I saw lots of them in Colorado, and noted that when they hover they have a characteristic way of flicking up their tail and seemingly the rear part of the body, which field guides don’t always mention, but which certainly helps with the identification. They are found in pretty well all the western states, south into northern Mexico, and are quite migratory, moving deep into Mexico and Central America for the winter. Stray birds sometimes show up in the east, as far east as Atlantic Canada, in fact, but they are primarily found west of the central prairies. 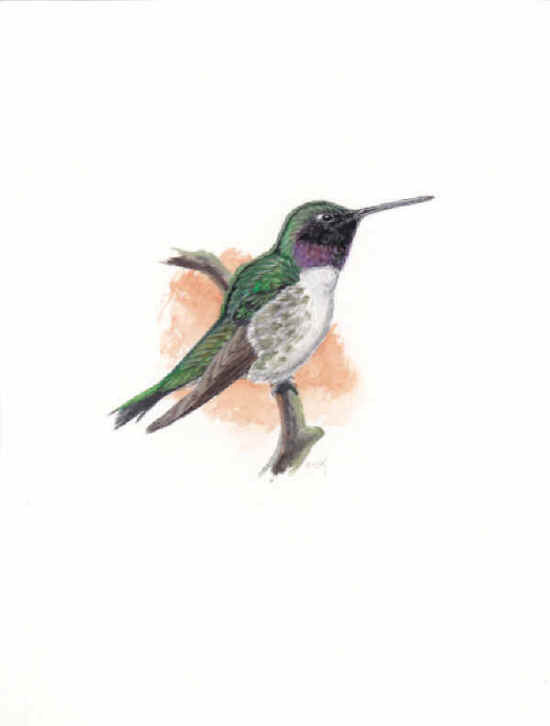 As hummingbirds go, they are rather drab and non-ornamental, although they show bright iridescent purple on the lower part of the throat feathers…called the gorget…which only appears in certain lights (otherwise the gorget looks all black), and rather dull green iridescence on the back and, to a lesser extent, the flanks. Females are similar, but have dull white throats with tiny dark centres to the feathers, thus no iridescence on the throat. 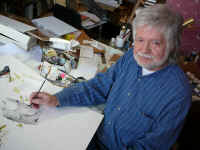 This is a gouache watercolour on paper, the original drawn about one third larger than life size.